The hoplite was the definitive soldier of ancient Greece. Hoplites are interesting not just for how they fought but for the social conditions that created them and the consequences that the hoplite style of warfare had for ancient Greek society. A hoplite was a heavily-armored infantry soldier equipped with a large, round shield and a thrusting spear a little over two meters in length. 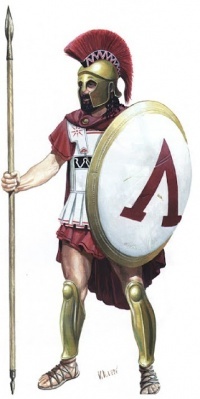 While the shield and spear were the two crucial pieces of equipment, most hoplites also wore heavy armor including a helmet, breastplate, and greaves (armor for the shins). Altogether this armor weighed as much as 30 kilograms. Weighed down by so much equipment, hoplites were slow-moving and not adept at maneuvering. A lone hoplite was easy prey for a more mobile skirmisher or cavalry soldier. 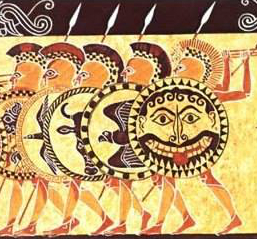 Hoplites were only effective when fighting as a group. Hoplites fought in a tightly-packed formation called a phalanx. Their equipment was designed to be most effective in this formation: the center of the large round shield rested at the elbow, meaning that only half of a hoplite’s shield was protecting their body. The other half of the shield protected the soldier standing to their left, while they were sheltered by the shield of the soldier to their right. The phalanx formation was designed first and foremost to offer as much protection as possible to the soldiers fighting in it. As long as the phalanx kept its order, casualties were low. When phalanges fought, they clashed head-on in a massive shoving match that was usually quickly resolved when one side lost its nerve, broke formation, and fled. Fleeing hoplites typically dropped their heavy shields to get away faster, but once one phalanx started to flee, the soldiers of the opposing phalanx were ill-equipped to give chase. The goal of a hoplite battle was to drive the enemy from the field, not kill them. In order to fight effectively, hoplites needed several things in addition to their equipment. First of all, they needed lots of training. Maintaining the phalanx formation while advancing into the fray and clashing with opposing forces was difficult. Even more important, it required cohesion among the individual hoplites. A formation that depended on every individual in it standing firm and protecting those around them could only work when those in it felt they could trust and rely on their fellow soldiers. That kind of unit cohesion could be created in several ways. Spartans created it through a brutal indoctrination into a culture of conformity. Companies of mercenary hoplites created it through shared experience in the field. But in most Greek cities, the solidarity of hoplite warfare was intertwined with democracy. 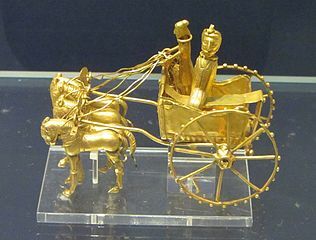 Hoplites appear quite suddenly in Greek history around 650 BCE, so suddenly that they seem to have been a deliberate innovation rather than a gradual development out of earlier traditions. There were other dramatic changes happening in Greek society at the time. For centuries, Greek society had been dominated by aristocratic families who monopolized both control of farmland and political power, but the growth of overseas trade undermined their authority. Some ordinary people began to get rich off of trade with the larger Mediterranean world and to demand more of a say in how things were run. In many places, aristocrats who were on the outs took advantage of popular discontent to put themselves forward as sole leaders who could keep the other aristocrats in check and represent the interests of the common people. The Greeks called these rulers tyrants, a word that did not originally have the negative connotations it carries today. These tyrants organized the people into a political force that could overwhelm the old aristocracies, and it seems likely they were also responsible for organizing them into a military force for the same purpose. The old aristocrats had relied on followings of professional warriors to compete with one another and protect their power. The hoplite phalanx was made up not of professional soldiers but farmers, crafters, merchants, and other ordinary folks who paid for their own armor and took time away from their livelihoods to train together. Their cohesion and solidarity overwhelmed the aristocrats’ paid fighters. The tyrants, backed by their hoplite forces, enjoyed a brief ascendancy, but most soon revealed themselves as little more than ambitious opportunists who had little real commitment to making life better for their supporters. The ordinary people turned against them. The experience of solidarity in common cause that had been instilled by the hoplite style of fighting became the core of a new way of organizing society, and after ousting their tyrants most Greek cities embraced forms of government that allowed for broad citizen participation. It is significant though that Greek democracy was always centered on the hoplite phalanx. People who did not have a role in the phalanx—women, the poor, slaves, resident foreigners—rarely had any role to play in Greek democracy. Human societies are complex systems. Their various parts interlock and affect one another. The ways in which people fight are shaped by the societies they live in, and shape them in turn. If your story has characters fighting in a particular way, you should construct your world to reflect the origins of that fighting style and its consequences. It is possible to have a hoplite phalanx without democracy (Sparta), and it is possible to have a democracy without a hoplite phalanx (medieval Iceland), but understanding how each one supported the rise of the other in ancient Greece will help you construct fuller and more believable alternatives. There are many ways to fight a battle, even in worlds without modern weapons and techniques. Two terms that are useful for thinking about pre-modern battles are heroic warfare and mass warfare. Heroic warfare is centered on a small number of leaders. These leaders are usually the most experienced and best equipped fighters their side of the fight can muster. They rely on their reputation as great warriors, so they need to stand out and be seen by everyone on both sides. In heroic warfare, battle begins not with both sides rushing into the fight but with the leaders stepping forward to identify themselves, boast about their victories, taunt leaders on the other side, and generally try to intimidate the enemy while boosting their own troops’ morale. Mass warfare relies upon large numbers of soldiers who are all similarly equipped and who fight as a group. Commanders often stand out so that their own troops can identify them and follow their lead on the field, but they fight as part of the group and success does not depend on their individual reputation. Historically, heroic warfare tended to be practiced in small-scale, culturally homogeneous societies. As societies grow larger and more complex, they tend to shift away from heroic warfare to mass warfare. There are practical reasons for this. The advantage of fighting in heroic style is that it greatly limits the number of casualties. The point of all the showing off and boasting at the beginning of the battle is try to convince the other side that they can’t win and so they’d be better off coming to terms and avoiding the fight altogether. For that to work, though, both sides have to have enough confidence in one another that they can make an agreement and expect the other side to honor it. That kind of confidence usually depends on having a shared set of cultural norms and values. It is much harder to manage across a wide cultural divide. At the same time, heroic warfare is not all for show. The message that a heroic leader is trying to send is: “If we actually do start fighting, we’re going to beat you.” For that message to be credible, the leader has to be able to back it up, and even the best leader is no good without followers. Heroic warfare depends not just on the leader standing in front but on the soldiers standing behind them ready to fight if the other side doesn’t back down. Heroic warfare works when the number of troops on both sides is small enough that one well-equipped, skilled leader’s participation in battle might actually make a difference. In larger societies that can put thousands of soldiers on the field, the talents of individual leaders are much less relevant to the outcome of a fight. We like heroes. As storytellers, we tend to focus on the stories of individuals, even in settings where the actions of groups matter more to the outcome. There is nothing new about this. Ancient myths and medieval romances are full of heroic warriors, even though they were told by people who lived in times of mass warfare. The ethos of heroic warfare is undeniably appealing, but if it is going to make sense in our stories we have to think about how to make it work in settings where it doesn’t naturally fit. 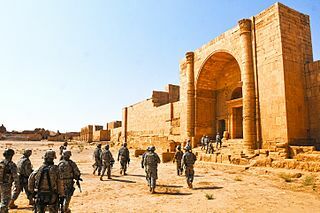 There is a place for heroic warriors in settings of mass warfare. Where most of the real fighting is done by mass armies, there are still times when a powerful leader can make a difference—when events that play out on a small scale matter to the larger battle and when threat and intimidation are called for. These are the moments we need to craft as writers. you can still find a place for someone like this. Images: Battle of Issus via Wikimedia (Museo Archeologico Nazionale, Naples; 1st c. BCE; mosaic). Stormtroopers via Giphy. Darth Vader via Giphy. Spartans are renowned as some of the greatest warriors of the ancient Mediterranean world, and with good reason. Sparta had a 3-century streak undefeated on the battlefield (minus the battle of Thermopylae, where they lost only to encirclement by Persia’s overwhelming numbers). They won many of their wars without even a fight because when their opponents saw a wall of Spartan shields coming towards them, they just gave up and ran. How did they do it? What’s so special about the Spartans? The exceptional experience of being a Spartan began at birth when a state official judged the newborn baby’s physical health. Only healthy babies were allowed to be raised. Those that were sickly, weak, or had visible birth defects were exposed in the wilderness to die. (Only the children of the kings were exempt from this rule.) At the age of seven, all male Spartans were taken from their parents and put into a state-run education called the agōgē. The agōgē experience was brutal. The boys were trained in hoplite combat while living on meager rations. They slept outside, all year long, with only one cloak. Violence between boys of different age groups was encouraged as a way of toughening them up. Just a part of the World War II Victory in Europe Day celebration in Trafalgar Square, London, according to author Connie Willis. What a delightful image, especially the bit about the bobby and the girl with the party favor! Willis, Connie: All Clear. New York, NY: Spectra, 2010, p. 14.